With rain expected in the afternoon, it was not surprising that St Albans decided to bat first after winning the toss. 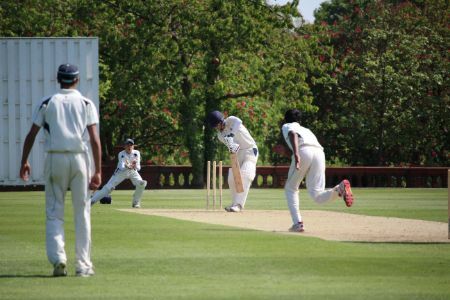 Despite the early loss of Josh de Caires (son of former England captain Michael Atherton), bowled by a good delivery from Chinmay Mullapudi, our hosts got off to a flyer, scoring freely at 6 runs per over for the first hour. During this opening period the Habs over rate was painfully slow and the fielding somewhat lethargic, and it took an unfortunate accident to change matters. In trying to take evasive action, one of the umpires slipped and fell, breaking his wrist in the process, and had to be replaced by Habs coach Dan Kerry, who then had the opportunity to impart some much needed ‘advice’ during the subsequent break in play. His words clearly had an effect as Habs sprung to life. Joe Granger captured the 2nd wicket almost immediately and then the dangerous Charlie Scott (46) was caught off the bowling of Saavan Shah, who conceded just 20 runs in an excellent 10 over spell. He received good support from the other spinners, Saihaj Singh and Amaan Lakhani, who also claimed a wicket apiece as St Albans were pegged back. On the stroke of lunch with the score now 133 for 5 after 34 overs, the threatened rain arrived and that, unfortunately, was it. Whilst most of the other games, having restarted before the rain, carried on to a finish, we sat around for a while and then, with exams looming for most of the players, took the sensible decision to abandon the match as a draw.